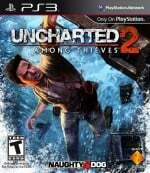 Uncharted 2 is an action-adventure platform video game played from a third-person view, with the player in control of Nathan Drake. Drake is physically adept and is able to jump, climb, and scale narrow ledges and wall-faces to get between points. Drake can be equipped with up to two firearms – one single-handed and one two-handed – and a limited supply of grenades. Drake can pick up weapons, automatically replacing the existing weapon he was using, and additional ammunition from slain enemies. The player can direct Drake to take cover behind corners or low walls using either aimed or blind-fire to kill his enemies. The player can also have Drake fire while moving. If Drake is undetected by his enemies, the player can attempt to use stealth to take them out, such as by sneaking up behind them to knock them out with one hit, or by pulling an unsuspecting foe over a ledge from which Drake is hanging. If all of the foes patrolling an area are killed stealthily then other waves that would normally appear do not. Some areas of the game require the player to solve puzzles with the use of Drake's journal, which provides clues towards the puzzles' solutions. When enabled, a hint system provides gameplay clues, such as the direction of the next objective.